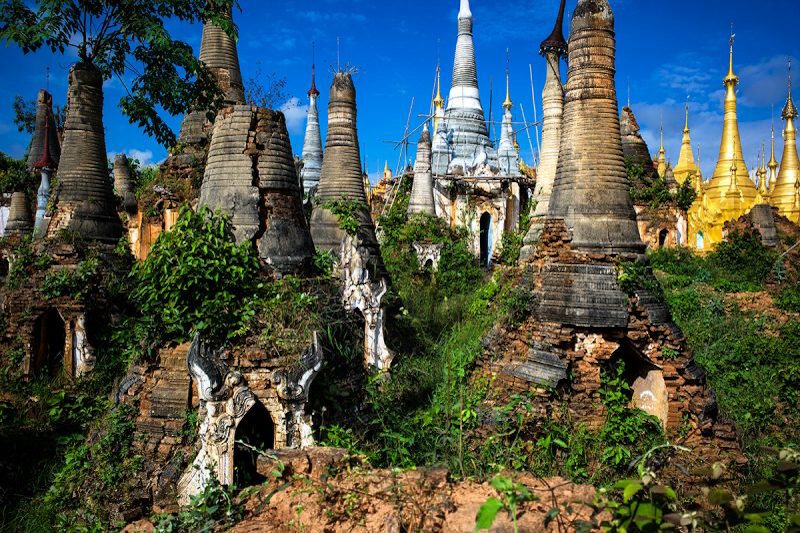 Myanmar (Burma) is a magical land where time seems to have stood still; it so far behind the rest of the world in development, it may actually be ahead. There are few better places to see truly sustainable communities that thrive because of, and in spite of, the environment in which they live. 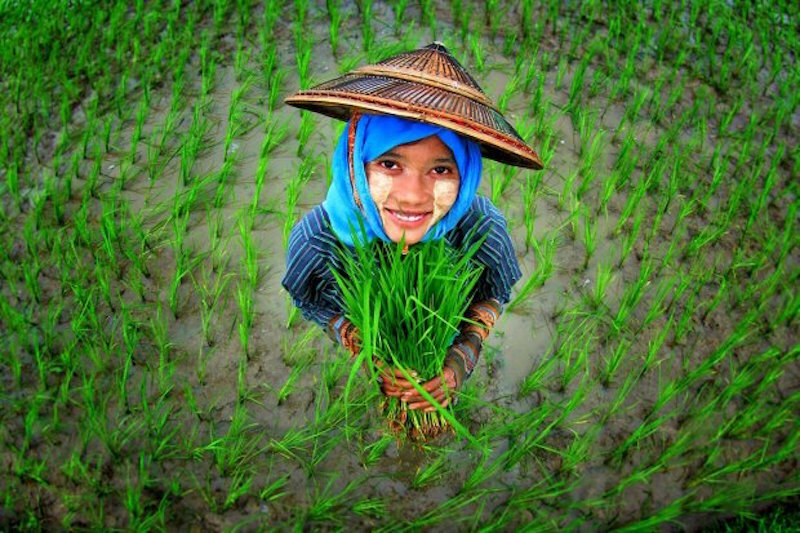 Inle Lake and the surrounding hills in Burma’s Shan State offer students remarkable lessons in human adaptations to their environment and in creating sustainable economies. The Intha, a Tibeto-Burma ethnic group that have made the lake their home for centuries, have adapted perfectly to a challenging habitat. They have developed a unique way to row their boats with their legs while standing upright to see over tall reeds and set their fishing nets. They create floating islands from lake vegetation to grow their gardens, build stilt houses to cope with fluctuating lake levels and have discovered a way to weave thread from lotus flower stems to create beautiful robes. 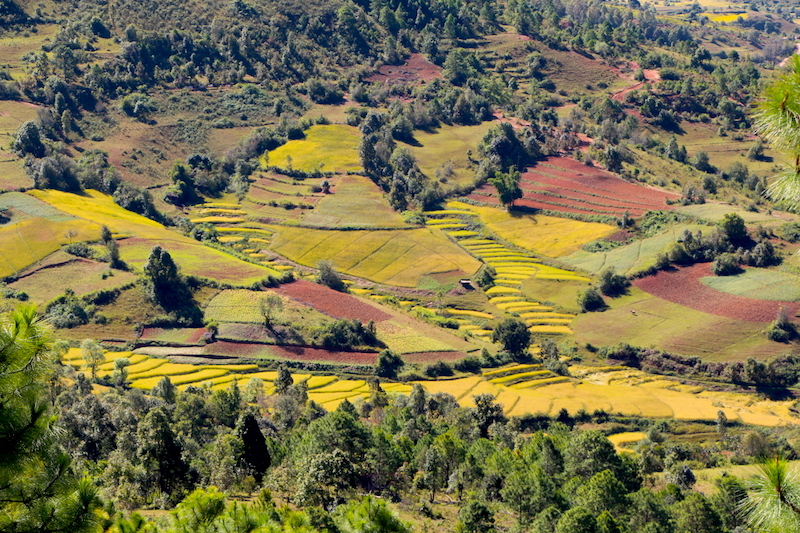 In the mountains surrounding the lake, no fewer than seven distinct hill tribe cultures thrive as cultivators of rich red soils, growing rice, safflower, potatoes, pumpkins, garlic, shallots and other crops for home consumption and market. 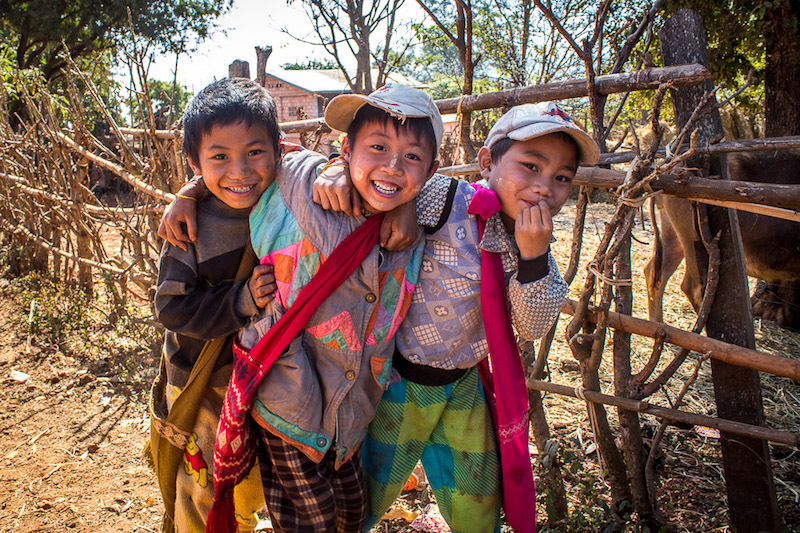 Trekking from one hill tribe village to the next through gorgeous landscapes, students on this trip will come to know the hardships and joys of local life. After a few days of trekking and spending nights in ethnic minority villager’s homes, students will descend to Inle Lake and fully immerse themselves in Intha culture. They will learn how to leg row, fish with traps, lake farm, weave lotus thread, build boats, barter for produce at local markets and cook traditional foods. 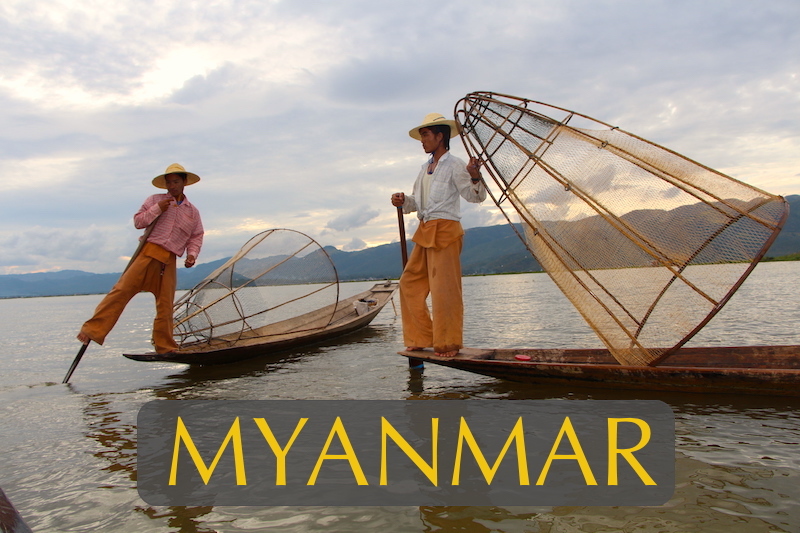 They will investigate environmental and tourism impacts on Inle Lake and Burmese culture. Students will discover fish and snail species found here and nowhere else, work with children in isolated island schools and orphanages as well as delve deeply into the ancient animistic beliefs the people here so seamlessly blend with Buddhism. Looking for a Shangri-la setting with fog-shrouded valleys, mirror-like lake waters, blue distant mountains and lovely peoples for an open-air classroom for a week? Look no further. Students arriving at Yangon International Airport will be greeted on arrival and transported to their hotel. Yangon, the cosmopolitan capital of Myanmar, still maintains its colonial charm with wide, tree-lined avenues, tranquil lakes and gracious turn-of-the-century architecture. 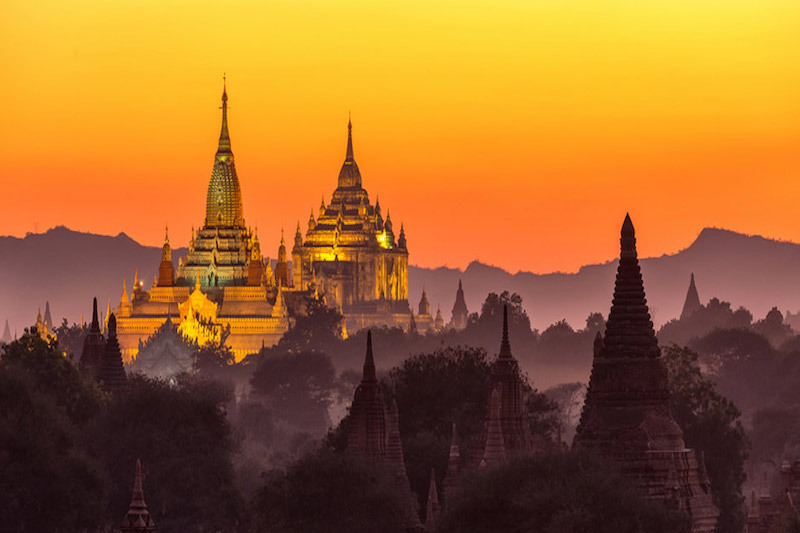 As a stunning introduction to Myanmar, we will visit the country’s most historic and sacred sight this evening at sunset. 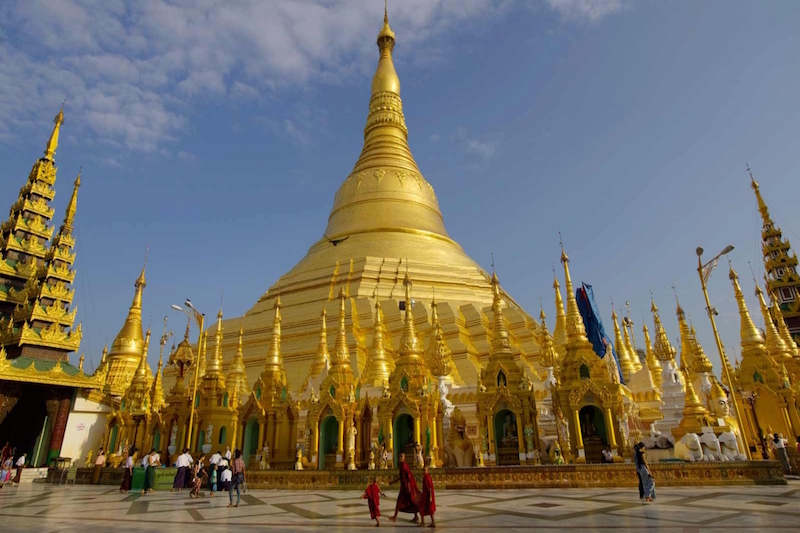 Shwedagon Pagoda dominates the city skyline and it’s countless layers of gold glow in the fading light of day. As lights turn on at dusk and worshippers arrive to make merit, Shwedagon takes on a magical air that never fails to impress. A welcome dinner this evening will be followed by a trip orientation session before we retire to the comforts of our hotel. After an early breakfast at our hotel we transfer by bus (30-min) to Yangon Domestic Airport for a one-hour flight to beautiful Shan State. Arriving in Heho, we transfer by bus (50-min) to the cool climate of Kalaw, a former British hill station where colonial rulers retreated during the hot months. Kalaw is graced with a delightful climate and flowers brought from England that now grow wild in a landscape fresh with the aroma of pine trees. After checking into the cozy comfort of our hotel, we will enjoy lunch and have time to explore the town’s temples and market by foot or bicycle until dinnertime. Dinner, served at a charming family restaurant run by seven sisters, will be followed by a discussion on British colonial rule in Myanmar, its impacts on Burmese culture and benefits. After a delicious breakfast at our hotel, we set off this morning on a two-night trek into remote hill tribe villages. After several hours gradually hiking uphill through pine scented forests we arrive at Hlutpyin Village where we will stop to share lunch with a family of the Taungyo tribe. It’s just a short hike from here to our overnight destination – Sha Pin Village, home to the Danung tribe. Arriving here early in the afternoon, we will have time to engage with 28 children in the village school. International students will introduce themselves by placing markers on a map of the world to show their country of origin. This map will them be donated as a gift to the village school. Students can then engage in teaching simple English language skills and sharing together in traditional games and sports with the village children. A delicious dinner will be prepared featuring fresh local fruits and vegetables before everyone gathers around a warm fire to share tales together. Waking at first light, like the villagers, we’ll enjoy a hot breakfast before resuming our trek higher into the mountains. After several hours we arrive at Linnpan Monastery where students will learn about the teachings and disciplines of Buddhist monastic life. Students will have opportunities through translators to interview the young monks residing here. 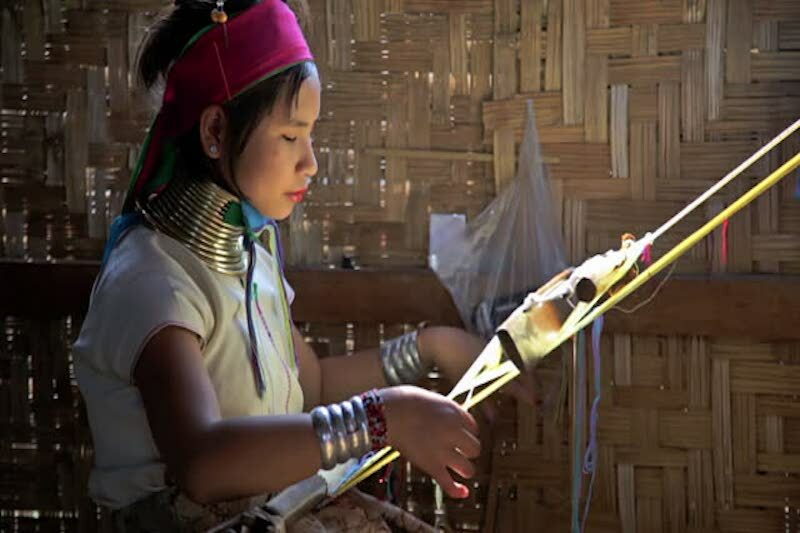 In doing so they will gain deeper insights into the deeply devout Buddhists of Shan State and learn how hill tribe people seamlessly blend Buddhism with more ancient animistic traditions. 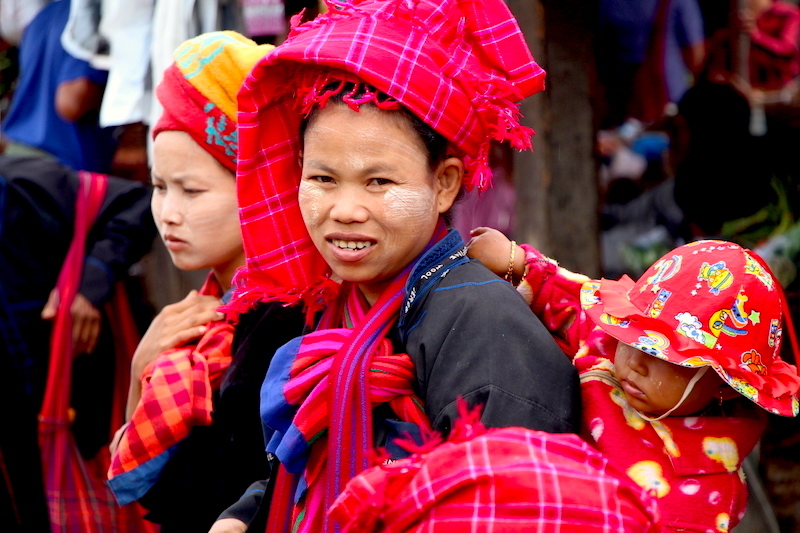 After a hot lunch in Linnpan we will climb another hour to our destination for the day – Kyauk Su, a Pao village where women adorn themselves with bright red and orange head wraps. The view from Kyauk Su can only be described as breathtaking as layer after layer of terraced hillsides and patchwork fields spread out in all directions below us. After a refreshing afternoon tea, we will set out in small groups to learn about the many technologies the Pao employ in their daily lives – building and repairing ox carts, ploughing fields, pounding rice into flour with giant wooden mortars, cutting pumpkins and vegetables to feed their bulls and water buffalo, and many more endeavors. Students that wish will be able to engage in most of these activities. Our dinner will once again feature foods fresh from the fields and village children will be invited to our campfire to share traditional songs this night. No one will want to sleep in this morning and miss the spectacular sunrise and the sea of fog that blankets the valleys below the village. Could there be a more Shangri-la setting anywhere? After a good hot breakfast, we set off on the last leg of our trek. Following a ridge top with panoramic views in both directions, we will enjoy a stunningly beautiful final day of hiking. It’s just a one-hour trek from Kyauk Su to Phan Phe where both Pao and Daung tribes reside together. We can visit another monastery here and meet the novice monks before completing the final two-hour trek to the Pao village of Nantalni. Nantalni is serviced by sealed road and offers an easy exit point for a 1-hour bus trip to the Intha town of Nyaung Shwe. 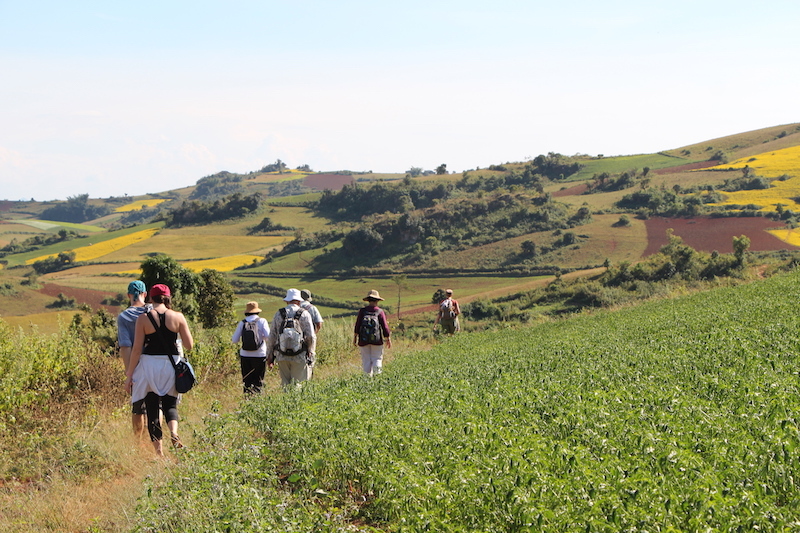 After a long trek eating local food, students will be thrilled to check into a comfortable lodge, soak under hot showers and enjoy lunch at Golden Kite Restaurant that makes the best homemade pasta and wood fired pizza in Shan State. After lunch we will have time to relax at our lodge or explore the town on foot or by bicycle. At 4:00 pm we will set off together to cycle down a lovely tree-lined boulevard (15-minutes) to Shweyanpyay, a century-old teak wood monastery that features classic examples of Shan architecture. 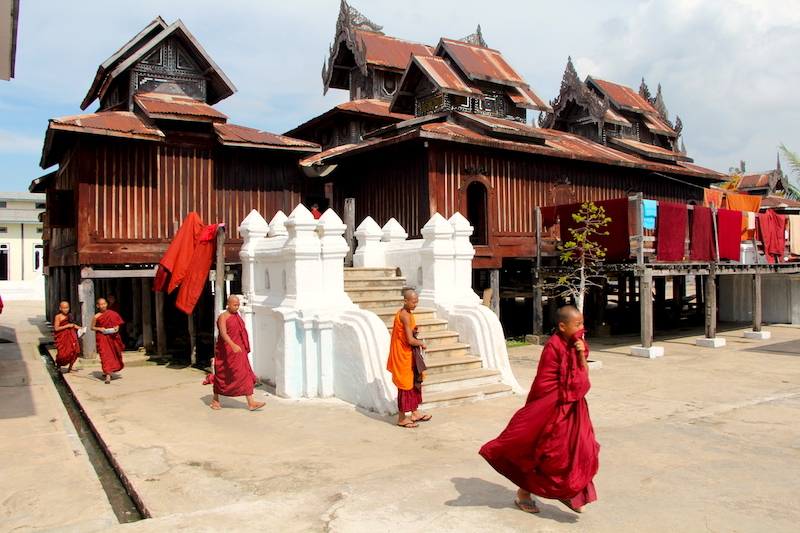 The monk’s residence and shrines of Shweyanpyay are truly beautiful to behold and the young monks here might like to join our students for an impromptu game of soccer. Bicycling back to town, there are many restaurants to choose from for dinner before retiring in the comfort of our lodge after a very full day. Today is a very special day where students will totally immerse themselves in the lifestyle of the Intha – the “sons of the lake”. After an early breakfast we walk a short distance to the Nyaung Shwe boat launch and cruise out a long channel into the vast expanse of Inle Lake. Over 22 km long and 10 km wide, the lake is like a shallow inland sea surrounded by mountains appearing blue in the distance. Our full day on the lake will include a morning visit to one of five village markets that rotate every five days. Here boats converge from villages throughout the lake to sell their produce and acquire their daily needs. 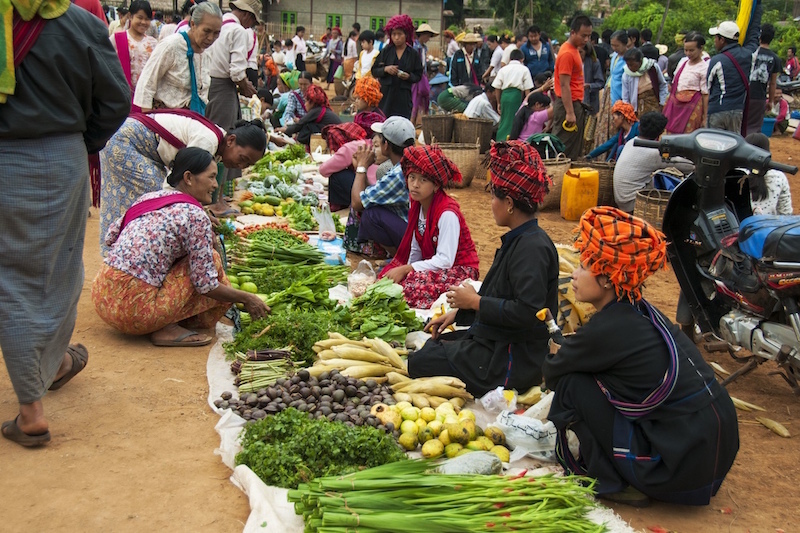 The colorful markets draw in many surrounding hill tribe peoples dressed in traditional attire and offer the best place to see Inle Lake’s 9 species of fish found here and nowhere else in the world. 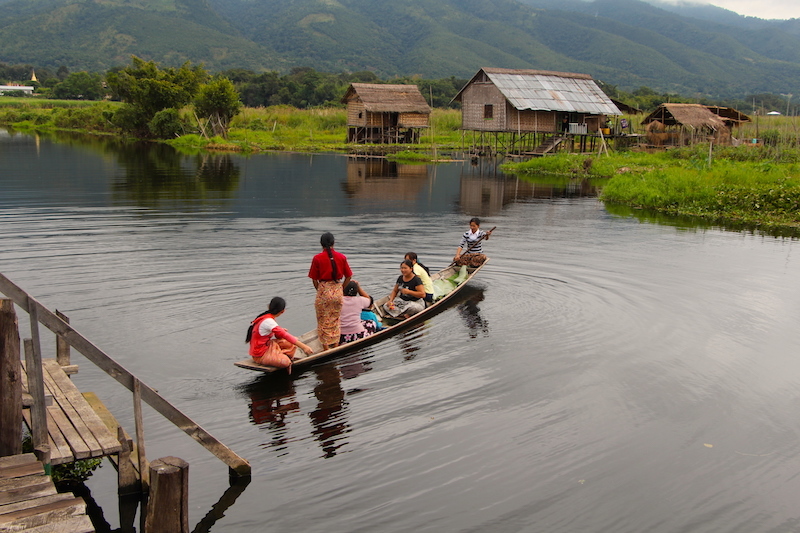 Over 70,000 Intha people live in and around the lake, many in small villages built on stilts above the water to cope with nearly two-meter water level fluctuations between the rainy and dry seasons. We will visit some of these houses to see how small cottage industries like cigar making, weaving, boat building and a blacksmith shop support local families. and weeks of work to produce a simple shawl. Students will try their hand at this as well as farming and fishing. Another unique adaptation of the Intha to their environment are their vast floating gardens made by pounding bamboo poles into the shallow lake mud and building up floating mats of lake weeds between them. These gardens never flood or go dry as they rise and fall with the changing lake level. Students will have an opportunity to see and experience how labor intensive this type of farming can be. The fact that Inle Lake’s floating gardens supply tomatoes and other crops to the rest of Myanmar testifies to its success. After a mid-day stop for lunch at a restaurant on the lake, students will face their greatest challenge of all – leg rowing! Intha fisherman are known throughout the world for their distinct rowing style which involves standing at the stern of their small craft on one leg while wrapping the other leg around the oar. This unique style evolved to help fishermen see over tall reeds and lake weeds as well as prevent back pain from bending over all day setting and pulling nets. While only Intha men practice leg rowing, and make it look easy, all students can give this a try and prepare for a plunge. A prize will be awarded to the student that best masters the technique. Returning to our lodge in the late afternoon we are likely to see some fishermen posing with giant fish traps for tourist photos. While this type of fishing has largely given way to gillnetting with the introduction of monofilament nets, it does demonstrate another unique Intha technology. Back at our lodge everyone can clean up before enjoying a great dinner together and taking in a Burmese puppet show for evening entertainment. The Burmese have long been masters of minaret puppetry, but the tradition is rapidly disappearing with the advent of television. Students will have the rare opportunity to see a master puppeteer at work during a 30-minute performance. The last full day of our trip is another great one. Right after breakfast we will set off on a bicycle adventure tour around the north end of the lake to further experience local life. Cycling down quiet lanes under the cool canopy of overhanging trees, we will pass processions of monks, farmers plowing their fields, children fishing with poles and bathing with water buffalo, and temples glittering gold on the hilltops. After 10 km of cycling we will reach the shoreline of Inle Lake and transfer our bikes to boats for a voyage through the Inle Bird Santuary where we are likely to see flocks of ducks, cormorants, herons, egrets, gulls, storks and jacanas. Landing 20-minutes later at Maithauk village, we will disembark along with our bikes on a long pier that connects the village to the deeper waters of the lake. Nearby is a family restaurant where we will stop for a delicious lunch. It’s just another 15-minute ride from the orphanage to our lodge where students will clean up in preparation for a Shan cooking class. To celebrate our last night together we will share in a traditional feast that students help to prepare. A closing ceremony will follow dinner with traditional Shan dancers, the awarding of program t-shirts, certificates of achievement and a closing candle circle where each student can share highlights of their study adventure. Depending on the group’s return overseas flight time, we have many flight options to choose from in getting from Heho Airport back to Yangon International Airport. 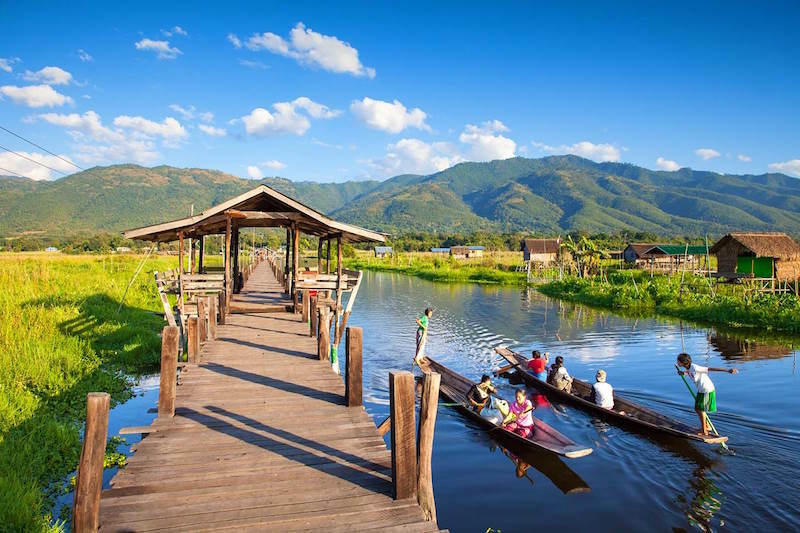 As the departing plane banks out over the hills surrounding Inle Lake, students will be able to see their entire hiking route and the magical Shangri-la setting of Inle Lake. It will be hard to believe so many wonderful experiences happened in such a small area.